Imagine having a rewarding career that lets you get paid to write. 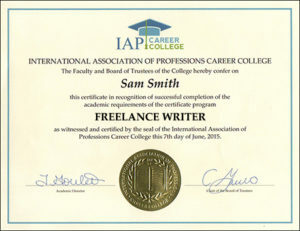 Welcome to the world of professional freelance writing! You may have dreamed of “becoming a writer” ever since you were a child, but now you can discover how to turn that vision into reality with the FabJob Guide to Become a Freelance Writer. The guide explains how you can start a freelance writing business and get hired to write for publication or write for clients. Writing for Publication: If you are like many freelance writers, you love to see your writing in print. There’s nothing quite like the feeling of picking up a magazine, newspaper, or book and seeing your own words on the page – knowing that thousands of people will read what you have written. Writing for Clients: If writing for publication is the “sizzle,” then writing for clients is the “steak.” While it may not offer the same excitement that comes with seeing one of your articles in a popular magazine, writing for clients can offer solid rewards including more stability and higher pay for many freelancers. The type of freelance writing you can do for clients depends on your expertise, and a client’s needs. Some writers specialize in working with particular types of clients. Others work with a wide variety of clients, but specialize in particular types of projects, such as writing newsletters, speeches, or scripts, to mention just a few examples. When you start your freelance writing business, you will determine what types of writing you want to do. You might choose a broad specialization such as “copywriting” or “technical writing” for any type of client that needs your help. Or you might choose a narrow specialization such as writing grant proposals for non-profit arts organizations, “ghostwriting” autobiographies, writing business plans for technology start-ups, “search engine optimization” for retailers, or any other area that interests you and that clients need help with. As long as you have the desire, you can become a freelance writer and start your own freelance writing business. No special education or experience is necessary to break into this career and succeed. 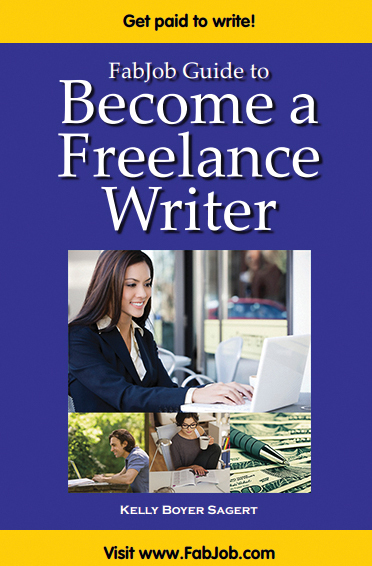 You can start your own freelance writing business and become a freelance writer immediately. If you would like to be paid to write, the FabJob Guide to Become a Freelance Writer is for you! In this e-book you will discover how you can get started and succeed in the exciting and creative freelance writing business. The guide's author is Kelly Boyer Sagert, who has written seven books and sold well over 1,000 pieces of her writing to magazines, newspapers, online sites and other publications. An experienced copywriter and grant writer, she also writes for encyclopedias and other anthologies, including publications from Macmillan and Harvard University Press. Kelly has taught writing for F + W Media, the company that publishes Writer’s Digest magazine, and she is Faculty Member for the Freelance Writer Certificate Course online offered by IAP Career College. In this guide she shares insider tips and expert advice from her own experiences and from a dozen other professional writers to help you achieve success as a freelance writer. Information about business matters affecting freelance writers including insurance, licenses, legal structures, etc. You can have all this and more for an incredible price. It can cost hundreds of dollars to take courses on starting a business, and chances are they will not include specific information about starting a freelance writing business. The FabJob Guide to Become a Freelance Writer contains some of the best business advice you could get from other sources, plus much more. The information in this guide can save you many hours of research, help you avoid some costly mistakes, and give you information you need to become a freelance writer and start your own freelance writing business. This guide has sold for up to $39.95 U.S. for an e-book alone. SPECIAL OFFER: If you buy the e-book today, you can have this valuable insider information for the incredible price of only $19.97. You can earn back much more than the price of the guide your very first day in business. Plus this guide can help you become a freelance writer and start a freelance writing business much more quickly and profitably. 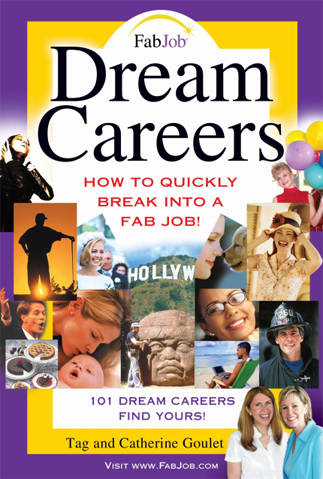 If you believe you deserve to have the career of your dreams, this guide is for you. It gives you what you need to know to become a freelance writer and start your freelance writing business.